Hey folks! I don’t usually pimp other stuff on here but I’ve been fortunate enough to be a part of this awesome Comic anthology, The Toronto Comics anthology Vol 3. They’re running a Kickstarter campaign right now and there’s lots of cool things going on. Please take a moment to check it out and help support independent writers and artists. Still better written than Sonic ’06. Good grief those are some freaky looking Sonics! I like that you gave one of the Beard-Sonics a mono-eye, like real one does. I warned you…I WARNED you about playing in all that toxic waste around the Sega headquarters. But no. No, you called me a worrywart and then started making out with that old Dreamcast. Now look at you. 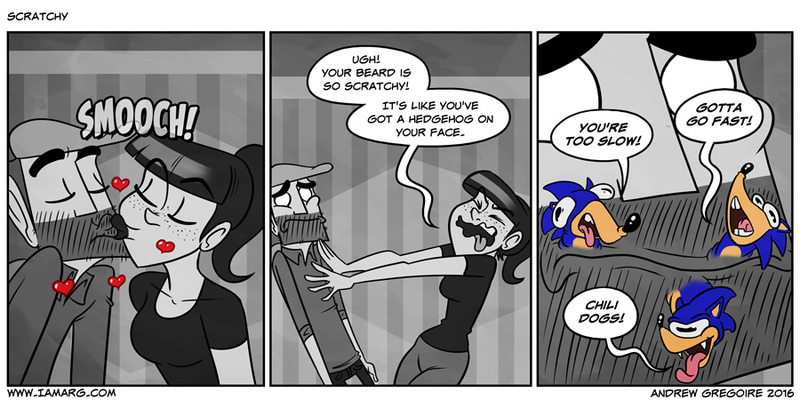 Deformed Sonics growing out of your beard. You okay over there? You haven’t like… had a major health defect you failed to mention on us did you? Cause… its been a while and… nobody wants to loose another good comic writer and artist.